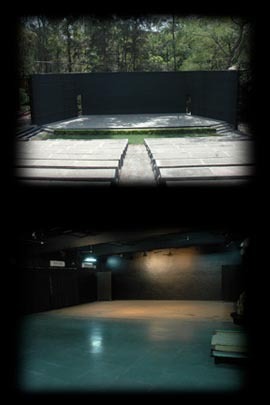 In keeping with the spirit of presenting Indian art forms, there are two spaces for performances within the MAHAGAMI campus- ‘Dyavaprithivi’, the open-air stage (seating capacity – 350, stage – 39′ x 18′) and ‘Baithak Sabhagriha’, indoor air-conditioned hall (seating capacity – 250, stage- 29′ x 21′, wooden floor). Two green-rooms with mirrors and proper lighting are located nearby. An indoor auditorium ‘Rukmini Sabhagriha’ is also located next to MAHAGAMI RUKMINI SABHAGRIHA which is air-conditioned with stage lights and sound system (Bose), cyclorama , AV projection system and three green- rooms. Performance spaces can be booked for cultural programs by other organizations on prior request and on payment of the booking amount.